Bestseller: Around 5.6 million sold! A convenient solution instead of gluing on a disc magnet. 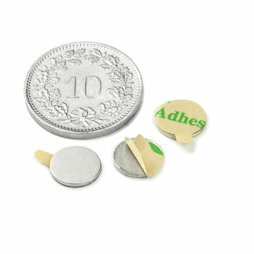 This is a very flat disc magnet (8 mm diameter, 0.75 mm thin) with a self-adhesive side. Just remove the film, stick it on and a smart mailing or creative arts project is ready to go. You can also use the S-08-0.75-STIC to hang up pictures without making holes in them.